Alex Pittsford ’20 – Looking back at my semester abroad, I’m surprised at just how much I was able to learn and experience in just four short months. From celebrating Oktoberfest on opening day in Munich to perusing the Christmas Markets in Heidelberg, I was able to experience an incredible amount of German culture, while also greatly improving my language skills. One major factor in helping cultivate this experience abroad were the funds provided by the Givens scholarship. My theme of study was based on a conversation with Dr. Greg Redding, where we discovered that Johann Wolfgang von Goethe, perhaps the most famous German author, had developed his own color theory. In order to pursue this topic, I decided to study artists influenced by this theory, which brought me to Hamburg, to see the works of Phillip Otto Runge in the Hamburger Kunsthalle, Munich, to see the works of Wassily Kandinsky in both the Neue Pinakothek and the Lenbachhaus, and London, to see J.M.W. Turner’s works in the Tate Classic. While this topic began with the color theory shared between these artists, the moment that stuck with me the most during my travels came during my visit to the Tate. Of the artists influenced by Goethe’s color theory, Turner is the only non-German. Despite this, I still found parallels, not only to Germany, but perhaps most surprisingly to the city in which I completed my study abroad. As I was working my way through the multiple rooms of his works housed at the Tate, I stumbled upon a landscape work that, despite my never having seen it, seemed eerily familiar. I had read during my visit that Turner had spent a significant portion of his life travelling Europe, Germany specifically, which is how he was introduced to Goethe’s color theory from the man himself. During his travels, Turner had spent some time in Heidelberg, the city in which I completed my studies and the subject of this eerily familiar painting. 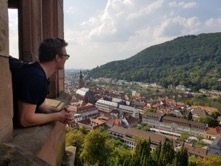 While the work was not complete, once I knew the subject was indeed Heidelberg, I started to recognize some of the characteristic landmarks in Heidelberg, from the castle towering over the city to the shore of Neckar splitting the city in half. This work gave me not only a feeling of nostalgia for what had become my second home, but it also allowed me to reflect on the interconnectedness of culture in Europe. This artwork, housed in one of the largest and most famous art museums in the U.K. and painted by one of the most famous British artists (in fact, the prestigious Turner prize is named for J.M.W Turner) managed to capture the ethos and aesthetic of a small town in Germany. This piece, while not the most well-known I saw during my travels, left the largest impact on me, and without the funds provided by the Givens family, I would not have been able to have this experience.